The 2019 upgrades of our DKW charts are now available. Among them are the popular DKW1800 series and DKW Vaarkaart Nederland. Are you a license holder of the 2018 charts? Then an advantegeous upgrade is available for you and you can use the 2019 charts immediately. It is still based on 2018 data but will be updated during 2019 which allows you to use the most recent charts. This means that you will be up-to-date until 2020. In 2018 a lot of inland water charts have been made suitable for our new technology where city names will always be shown upright during course-up mode (WinGPS 5 Pro/Voyager and WinGPS Marine Plus). In 2019 all our inland water charts will be suitable for this technology to create an even better and clearer chart image. Sail, plan and practice all winter with recent charts. Be the first to receive the 2019 updates. Weekly updates for DKW1800 and DKW German Bight. DKW Vaarkaart Nederland updates every other week. € 20,- discount on 100% DKW chart sets with the Service Card 2019. For some help installing your new charts, follow this link. 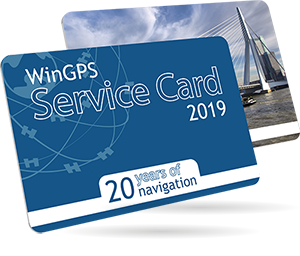 Service Card 2019 holders get an additional € 20,- discount on the 2019 upgrades (except the Imray charts). The discount will be applied automatically. The Service Card 2019 is only € 60,- in November. The Service Card will give you the 2019 version of WinGPS and allows you to participate in several actions and discounts.